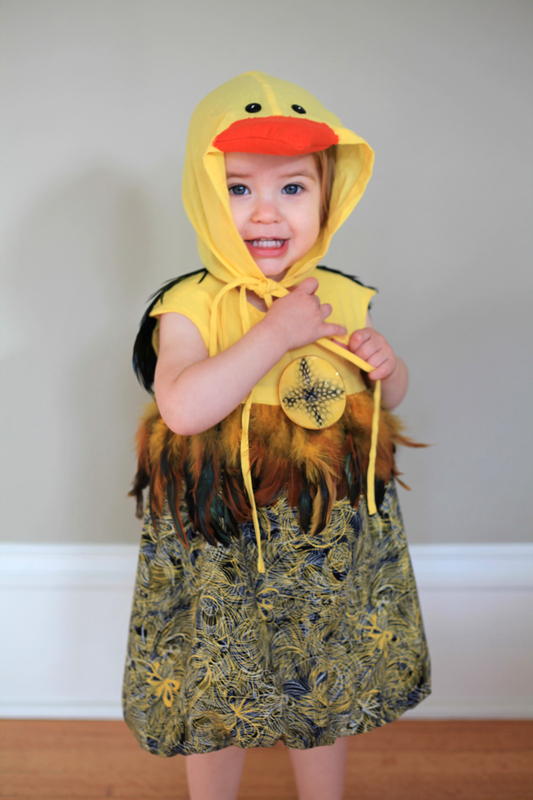 Home Children's	Happy Halloween from a Darling Little Duck! Happy Halloween from a Darling Little Duck! Happy day before Halloween everyone! It’s my daughter’s second Halloween, and I just had to make her another costume. While she was the cutest little black kitten last year and I’d happily have her be a cat every year (because cats and sewing go hand in hand! ), I decided to make her into a darling little duck this year. Why a duck? Well, because she really likes ducks and all things water related right now. She figured out how to say “duh duh” pretty early on, but it wasn’t her way of saying Daddy – it was her way of saying duck. (She used “Mama” as both Mommy and Daddy for the longest time. Then one day I became “Mommy”, and my husband finally became “Daddy”.) Not to mention that she has a huge collection of rubber ducks for bath time. 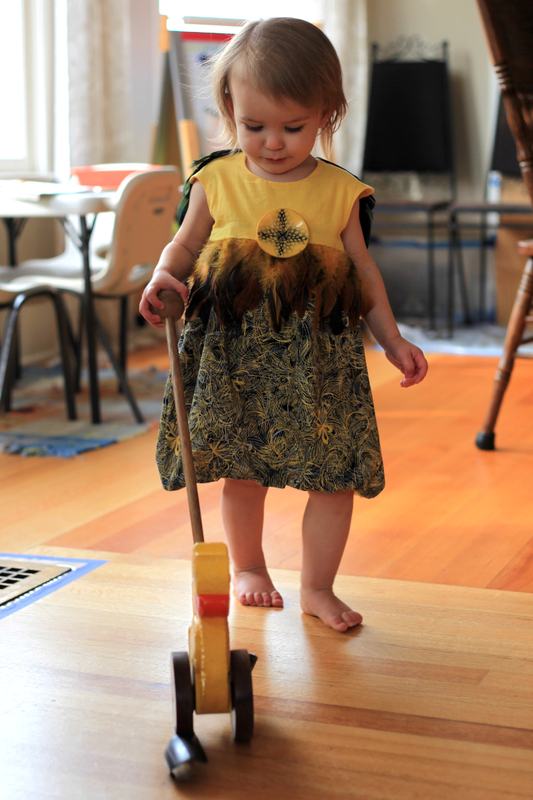 And, my dad made her a wooden duck push toy that she loves to walk around the house and up and down our street. Ducks have been a theme around here for awhile. Plus, I was really excited to have an excuse to finally sew with feathers. If you can believe it, feathers don’t really fit into my day-to-day routine. But, Halloween is definitely a time to sew outside the day to day. 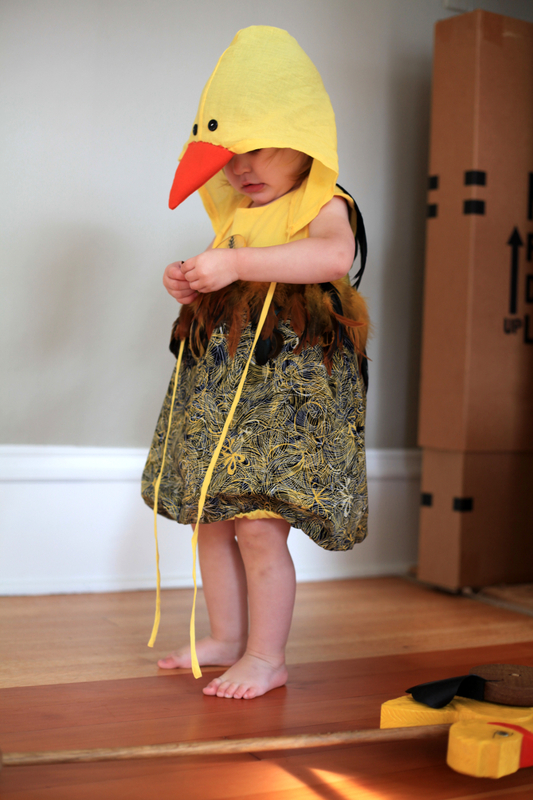 At first I figured I’d sew a bright yellow duck costume with lots of yellow feathers – something that would look very close to her duck push toy or the classic rubber duck. 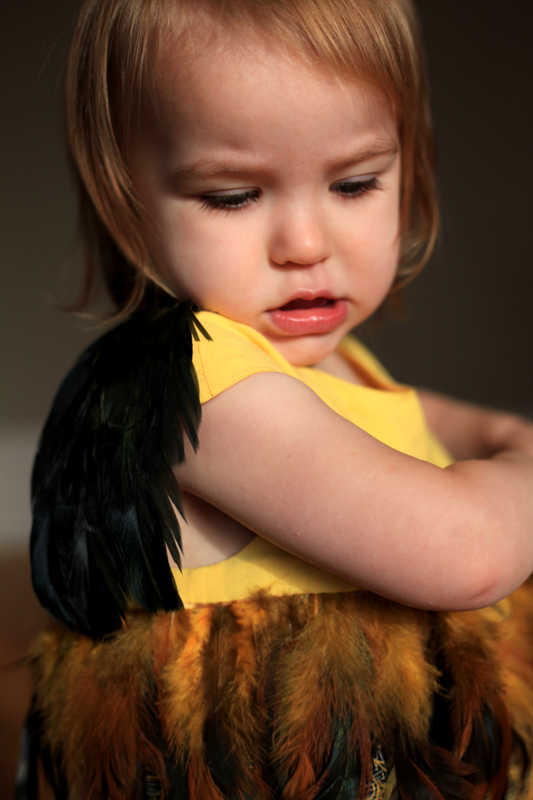 But, Mood had just sold out of solid yellow feather fringe (Hmmmm… I wonder how many others also wanted to be ducks for Halloween this year?! ), so I decided to expand away from the all-yellow duck costume idea. 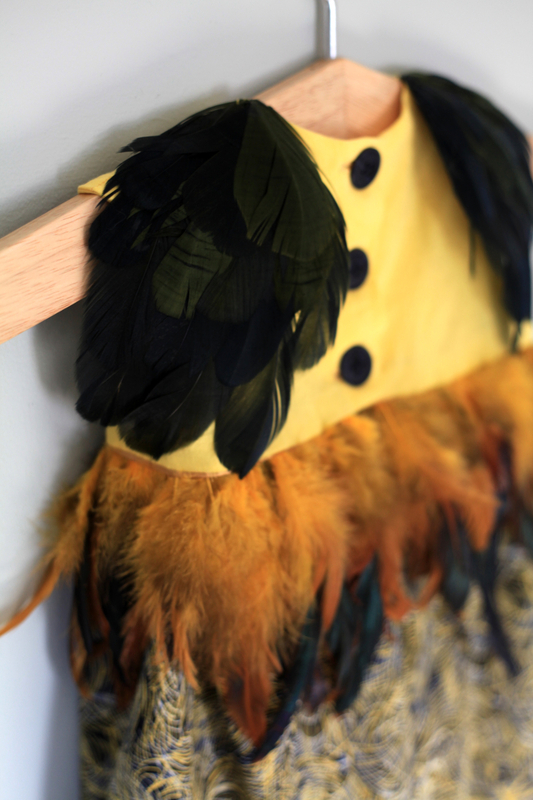 Instead of bright yellow feathers, I chose Mood’s Yellow Feather Fringe, a fringe that gradually shifts from a dark yellow to dark greens and blues. With a fringe chosen, it didn’t take me long to figure out that I wanted to sew feathers along the empire waist line of the Oliver + S Bubble Dress, the same pattern I used last Halloween (and first made here). The colors in the fringe led me to the Liberty of London Kenzos Leaf Yellow/Blue Cotton Poplin, which I decided to use for the skirt. While the print may be designed after leaves, I thought it also worked well as yellow and white feathers on a navy blue background, taking the duck costume from my original simple and cute idea to something darling and glamorous. I continued adding dark green and blue elements with the little feather wings (aka goose feather pads) and the three navy buttons used to close the back bodice. I like the contrast of the dark against the yellow cotton lawn used for the bodice and how the feather wings sit on her shoulders. 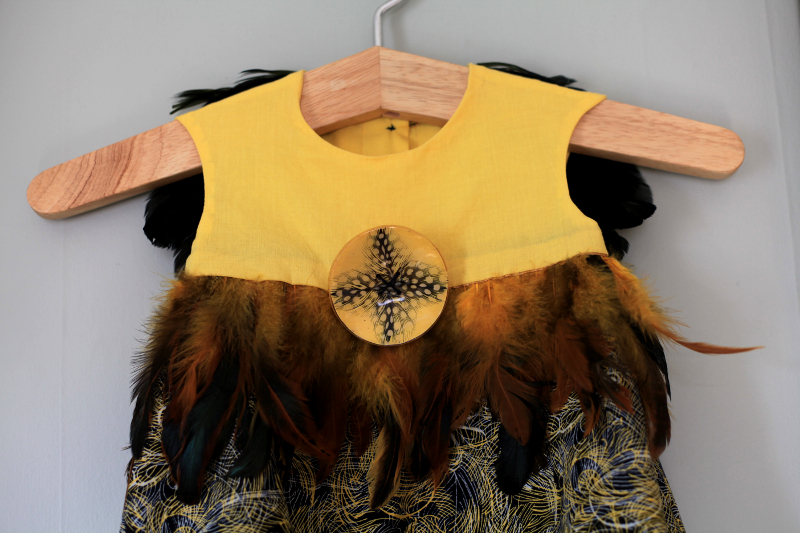 The last detail to mention is the giant yellow feather coconut button. 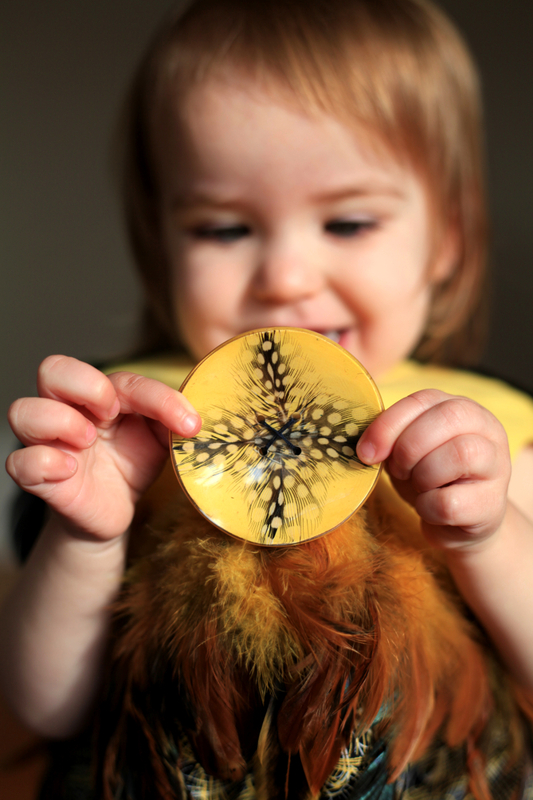 I saw it when I was browsing Mood’s site for feather-related things, and I thought the giant button would add a bit of whimsy and fun. I wasn’t sure at first where to put it, but I’m glad I put it front and center since my daughter loved playing with it while I was taking photos. 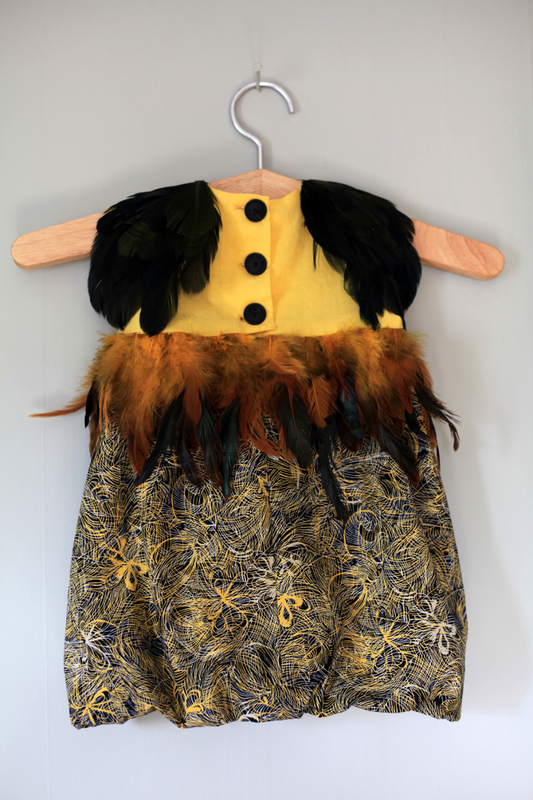 Though the feathers and the yellow bodice are supposed to let you know this dress is meant to be a duck costume, when it was all sewn together, I thought it didn’t scream “duck” as much as an all-yellow costume might have. So, at the last minute I decided to make a hood to help round out the costume. I used the pattern pieces from McCall’s M4642, the yellow cotton lawn that was used in the bodice, and some orange denim and black buttons from my stash. My guess is that I’ll end up being the one carrying (wearing?!) the hood five minutes into the neighborhood Halloween parade, but I’m glad it’ll be available whenever my daughter will tolerate it. Okay, now for the nitty gritty. The cotton lawn and poplin were easy to sew. The lawn was a bit thin, but I expected that from its description. I used the lawn for both the bodice and its lining, which helped to brighten the color and served to make the bodice opaque. I also used the lawn to line the skirt (see below, peeking out from the bubble hem), and its thinness prevented it from competing with the lovely body of the poplin in the bubble skirt. Adding the feather fringe was remarkably easy. The fringe was held together by a ribbon that was 5/8″ wide, so I just used that as my seam allowance (the prescribed seam allowances for this pattern were actually 1/2″). The ribbon peeks out just a tiny bit, but it’s hardly noticeable. The downside is how thick the ribbon and feather ends make the seam allowances. I didn’t have the courage to trim them down since I worried feathers would start coming out (especially since I figured it wouldn’t take my daughter long to try to pull feathers out herself! ), so I left them as is. In the close ups of the bodice above, you can pretty clearly see where the seam allowances end. But, no feathers were lost while taking the photos for this post, so I take that as a win! 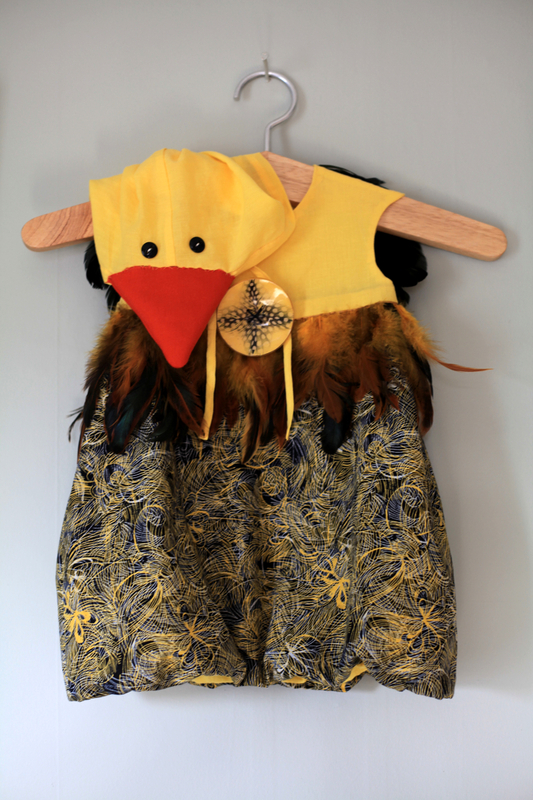 A lot of the other details were hand sewn on – the feather wings, the buttons, and the duck bill, for example. I chose white thread for the button eyes to add a bit of life to them. The bill was freehanded and stuffed with polyfill to give it a bit of shape. Next, the sizing. I mistakenly decided to go ahead and cut one size up since my instincts seem to be to make something she can wear for the next six months. I did the same thing last Halloween, and I should have learned then that it’s okay to cut her exact size for this kind of a costume. The hood ended up extremely big – so big that even I can wear it! I think making the hood out of a cotton lawn instead of the intended fleece and then binding the bottom edge instead of sewing it into the top for which it was designed resulted in a much larger hood than the sizing intended. On the plus side, if my daughter decides she wants to be a duck for the next 16 Halloweens, I won’t need to make another hood! I’m excited to take my daughter out to the neighborhood Halloween parade this year and watch how she reacts to seeing other kids in costumes. Last year she was too young to have any idea what was going on, but I think this year she’ll be able to get something out of it. Here’s to hoping she has a very happy Halloween. And, here’s to also hoping all of you have wonderful Halloweens as well!